If you can't attend in person, you can attend in spirit! Volunteer Positions, includes: Water/Snack Distribution, Course Marshal, Event Set Up, Kids' Zone, Tear Down, Water Stations. Deadline for hats is May 20, and for shirts is May 27. The Outrun the Sun Race Against Melanoma is not just another race. To the survivors who don their special blue race T-shirts, it’s a reminder that life is a gift. To the families who gather in support of loved ones with advanced melanoma, it’s a race against time to finding a cure. To the donors and sponsors who support the event, it’s knowing that your support has meaning and impact. Outrun the Sun, Inc. is dedicated to building awareness of melanoma and other skin cancers, educating communities about preventive measures that reduce melanoma’s incidence rate, and to raising funds for melanoma research, leading to effective treatments and a potential cure. 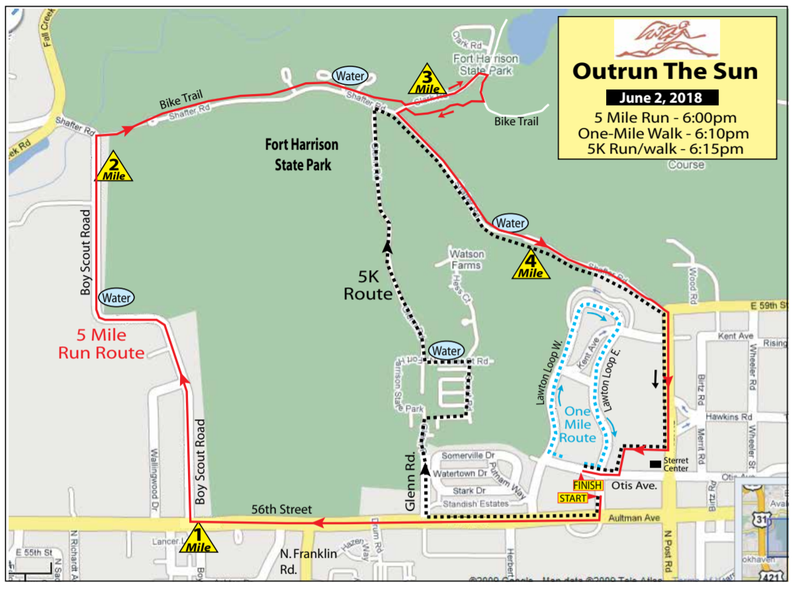 The Outrun the Sun Race Against Melanoma includes a 5-mile timed run, 5K non-competitive run and a 1-mile fun run. Races are followed by the Sunset Festival where friends and family can gather for music, food and fun. 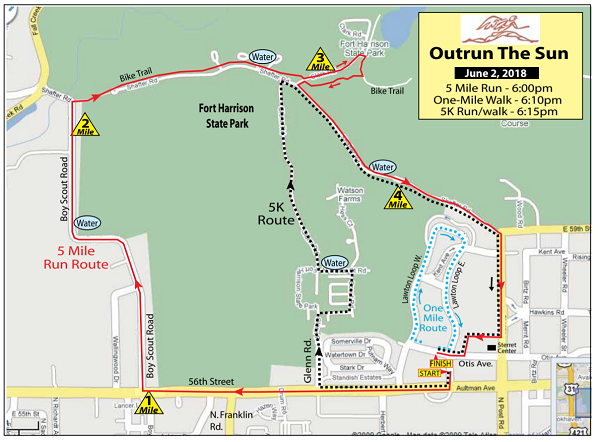 Event proceeds benefit skin cancer education and melanoma research programs at Outrun the Sun, Inc.
Outrun the Sun, Inc. is a 501 (c) (3) nonprofit tax-exempt organization. Outrun the Sun is a nonprofit organization that relies on generous donations to support its education and research programs. You are encouraged to collect online donations from your colleagues, friends and family. If you know an organization that may be interested in becoming a sponsor of the Outrun the Sun Race Against Melanoma, please contact the OTS office: 317-253-2121. If you are unable to attend the event but still wish to support skin cancer education and melanoma research, register as an "In Spirit" participant and create your own personal fund raising page. The Sunset Festival includes music, food trucks, wine and beer tents, health and wellness tents, games and a Kids' Zone. Please come prepared to spend time with friends and family prior to and following the Outrun the Sun Race Against Melanoma. Kids' Zone: While children over the age of six must be paid registrants, all children 10 and under are welcome to participate in our free Kids' Zone. Activities include kids' runs, giveaways and sun-safe activities. Children MUST be accompanied by an adult. Please do not drop off your child in the Kids' Zone unattended. elevations. Strollers are not permitted in the timed run. 1-Mile walk consists of a scenic course around historic Lawton Loop. It is a flat course. Strollers are welcome. You must be at least eight years old to participate in the 5-mile competitive run. For insurance and safety reasons, headphones, roller skates, inline skates, wagons, bicycles, skateboards or other similar equipment will NOT be permitted on the course. For insurance and safety reasons, pets are not permitted on the course or the premises at any time. Children over the age of six must be paid registrants. ALL adults attending the event, including those choosing not to participate in a race, are required to pay the registration fee. Athletic Annex will be providing awards for the top three Overall finishers in the men's and women's categories, as well as Age-Group awards! Volunteers are an integral part of any Outrun the Sun program. By giving your time and energy to the Outrun the Sun Race Against Melanoma, you help Outrun the Sun, Inc. fund skin cancer education and melanoma research programs. Your help makes a tremendous difference and we thank you! Volunteers will receive assignment instructions and volunteer T-shirts when they check in on race day at the Volunteer registration tent. While we will do everything possible to allow you to volunteer in the area you have selected, we may need to shift volunteer responsibilities to where the need is greatest. When this page loaded, the official time was 10:15:38 PM EDT.